Looking for the highest paying online surveys that pay cash? Getting paid to take online surveys that pay cash are all the rage these days. It’s a quick way to make money online or earn a side income in your spare time. You may also want to check out my other post for more ways to get free money. Companies are spending billions of dollars each year on focus groups, surveys and free product testings. So this is your opportunity to have your opinion heard while getting paid to do it! While you can find many legitimate paid online surveys sites, sadly there are many scam ones that will refuse to pay the panelists for their participation or even steal your personal information. But don’t worry because we’ve scoured the Internet to find the legitimate and highest paying online surveys sites that are most reliable for you to join. I encourage you to do your due diligence to see which surveys are best suited your own interests and earning expectation. Related: Discover more surveys for money opportunities here. What are some survey sites that actually pay? Since each site has a limited number of surveys each person can take per month (you also won’t qualify for all of them), I’d suggest you sign up to as many online surveys for cash as you can. 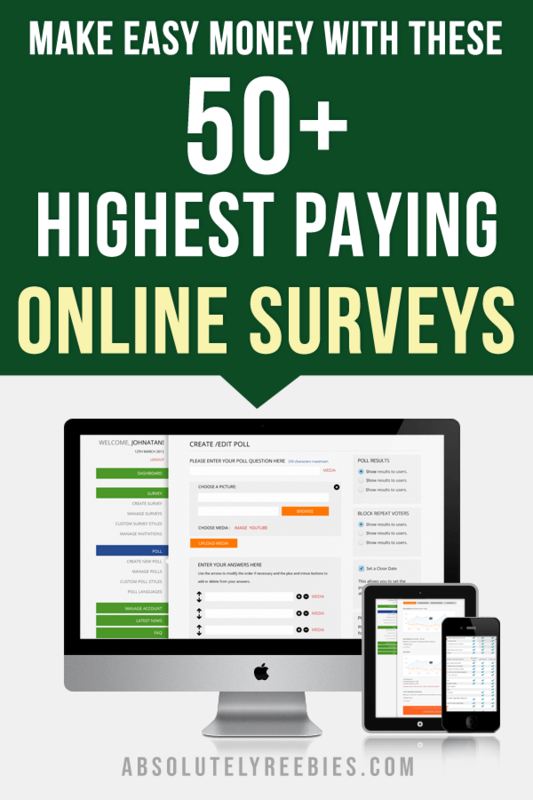 This way, you can get more out of these highest paying survey sites. Also, you may want to create a new email address just for surveys to separate the survey emails from your personal inbox. Most of these survey sites will reward you cash, gift cards, points or pay you in check or PayPal. This varies from site to site and you should be able to choose your preferred payment option. To make it easier for those looking for the highest paying international survey sites, I’ve categorised them into geographical locations, i.e. survey sites in America, Europe, Asia, South America. Without further ado, here are a few free paid surveys can join right now. Survey Junkie is one of the highest rated survey sites online and an easy one to start making money with. With over 3,000,000 members, your opinions help influence and improve products and brands. Survey Junkie works on a points system where 1,000 points are worth $10. You can earn points immediately by completing profile surveys and referring friends. The longer the survey the more points you’ll get. So it won’t take you long before you reach the 1,000 points payment threshold when you can cash out via Paypal or retailer gift cards. Besides answering surveys questions, you can also earn points for watching videos ($10 bonus), searching the web ($10 bonus), installing a browser and more. These activities are pretty effortless allowing you to make money from them quite easily. So far, they have paid over $300 million in rewards in the 12 years they have been in business so they pretty legit. You’ll get $5 just for signing up. They also have a great referral program where you’ll earn 10% of your friends’ earnings. Like Vindale Research, InboxDollars rewards you in cash only so there’s no need to worry about converting points to cash. You can redeem your points for gift cards if you like though. That means your payout may be slightly lower than if you were registering directly with the surveys sites yourself. That said some surveys are pretty exclusive allowing you to earn $50 or even $115 from featured studies. For that, SurveyClub is worth joining. Toluna works on a points-based system. Depending on the length of the survey, you get paid between 500 – 30,000 points per survey. Their questions revolve primarily around your shopping habits and your opinion on many products. Sometimes you can participate in free product testings too. You still earn 15 points for answering the screening questions even if you don’t qualify for a survey. Once you reach 30,000 points, these points can be exchanged for PayPal cash or retail vouchers. That may seem high but keep in mind that the average surveys pay 3000 to 6000 points. You also get 500 bonus just for signing up and hundreds of points for referring friends. As a member of the YouGov panel, you will be part of a global community of people who share their opinions in return for points and rewards. Rewards will be in cash, gift cards and prize draws. While not the biggest survey site, earning cash with OneOpinion is pretty straightforward. You earn points by answering surveys. Even if you don’t qualify for a survey you’ll still earn 50 points for the screening. Once you reach 25,000 ($25) points, you can cash out with PayPal, or get gift cards to Amazon.com, Visa Gift Cards, and more. Besides surveys, OneOpinion also offers product testing where you test new products at home and get to keep the products before they are released to the public. Unlike other survey sites, Vindale Research rewards you in cash, not points. For each completed survey, Vindale pays between $0.25 and $50. They also offer multiple survey formats and pay you for doing other activities such as reading emails, watching videos, reviewing a website and more. Make sure that you complete all the profile questions to improve your chance of qualifying for the right surveys. Vindale Research also has a referral program where they pay you $5 for every friend you refer to them. There’s no limit to number of friends you can refer to! Harris Poll is a reputable and legitimate panel you can trust. Become a member of the Harris Poll Online and you will have the opportunity to influence important decision makers in government, corporations, and non-profit organizations. You can help shape the policies, products, and services they offer you. Besides surveys, you can also join focus groups. For each completed survey, Harris Poll enters you into their bi-weekly and quarterly Harris Panel sweepstakes and rewards you with 15 bonus HIpoints even for surveys where you disqualified. Minimum payout is 1250 points ($10) via e-gift cards which you’ll receive instantly. You get 75 points just for joining. By joining Mobile National Consumer Panel, you can make a difference to influence the products with your shopping opinions, earn points towards gifts and take part in the weekly, monthly and quarterly sweepstakes. It’s an exclusive panel by Nielsen, the company behind Nielsen TV rating. As a member, you use their mobile app or scanner to scan your purchase receipts and provide other purchase details. In return, you’ll earn points to redeem for gifts, sweepstakes entries, prepaid Visa gift card and more. They have weekly cash sweepstakes and the quarterly sweepstakes award is $20,000. Their other surveys pay on average of $1, that’s not much but it usually takes less than 10 minutes to complete. Ipsos is also popular because you get frequent invites. A market research program where your members will be able to take daily surveys and win fabulous prizes. Got an iPad? MobileXpression pays you to use your mobile device. They are a market research community dedicated to improving the mobile Internet. Earn a gift card after you’ve been an active member for only 1 week. Plus, by keeping the MobileXpression software on your phone or tablet computer, you’ll be eligible for additional credits each week that can be redeemed for more gift cards! While joining is free, you must be at least 18 years old to qualify. Get paid to share your opinions with MakeSurveyMoney, plus, get a $5 bonus just for signing up. They have surveys on many interesting topics, time estimates to complete each survey as well as how much you can earn from each survey. To join, start by answering questions to tell more about yourself, your household and the devices you use. Then download the Nielsen App to all of your registered devices. After you’ve installed the app, get rewarded just for browsing the Internet as you normally would. To be clear, they won’t pay you directly but getting rewards is pretty effortless. For each installation of the Nielsen app, you will automatically be entered into their sweepstakes. To make sure you qualify, only sign up for this if you are a Spanish speaker residing in the US. According to PrizeRebel, it only takes 10 seconds to sign up. To start earning, complete a paid online survey to earn points. Each time a member cashed out a reward, a notification will pop up on their homepage. So this is pretty reassuring in that you don’t have to worry about getting scammed. Prize Rebel has been around for 9 years and has paid out more than $9 million dollars to members. Redeem your points for Paypal cash, and gift cards from over 100 brand name such as Starbucks, Amazon, Visa, Walmart, Burger King, Nike and more. MindsPay is more of a product testing sites and than strictly surveys for cash sites. Even then, they don’t send you the products to test but its more of getting cash back for shopping online. If you are looking to buy something already and want to save some money while doing it, it’s a program you can consider. The minimum cash out is $50 via PayPal. The following are paid online surveys available for members from outside of the US. Since most of them are the same companies as I reviewed above, I won’t provide detailed descriptions for each of them. Feel free to check them out according to your location, background and interests. You can sign up to as many surveys that pay cash as you can. That’s the only way to find out the highest paying online surveys that fit your target group. Join the Ipsos i-Say Panel & you will be entered into a draw for $5000. Another consumer research company, PineCone Research conducts online interviews with consumers from all backgrounds to obtain their opinions about new products. Join Opinion Outpost and start sharing your opinion. Complete online surveys to earn MarketPoints to redeem for cash. Express your thoughts and turn them into reality. You could also win 1 of the 30 prepaid shopping cards worth £90 each! Shape the future of the internet and earn while you surf! Sharing your opinion has never been so rewarding. At Opinion Outpost, you can make a difference and earn extra cash. Global Test Market is a community of people around the world who take online surveys for leading market research companies. Earn rewards for every online survey you complete. Join the Ipsos MyView Panel where you will earn Reward Points for taking surveys. Your Opinions Count! Join this exciting community and share your opinion and get paid for taking surveys. Get rewarded just for using your mobile device! By joining the Nielsen consumer panel, you will have the ability to influence the products you see on store shelves when you go shopping. Valued Opinions is a service which rewards you for taking part in market research surveys. Receive up to $5 for each survey you complete. New Zealander can take part in this market research surveys by Valued Opinions. Receive up to $5 for each survey you complete. Below are some of the best international paid survey sites. Again, since most of them are the same companies as I reviewed above, I won’t provide detailed descriptions for each of them. Feel free to check them out according to your location, background and interests. I recommend signing up to as many online surveys for money as you can. That’s the only way you can find out the highest paying online surveys that fit your target demographic. Your opinion counts. Take a survey now and let your opinions be heard! Join the Nielsen computer panel and shape the future of the internet & get an opportunity to earn rewards straight away while browsing the internet. You can redeem up to €35 vouchers in the first month and more the longer you stay. GlobalTestMarket is a unique online community where consumers from around the world participate in online paid surveys. Share your valuable opinions and get rewarded for your participation. Join Toluna where members test products for free and share their opinion. You have the power to influence some of the world’s largest brands, share your insights, and be rewarded. Instantly at Toluna! Join this exciting panel and get rewarded for sharing your valuable opinion. Making money answering surveys is possible. It’s a potential win-win situation for you and the survey sites. They get valuable market research from a targeted survey audience and you are paid for your time. You can do a survey while on lunch break, waiting in a queue or during TV commercials. Be warned though, they can be time-consuming but they do work! You just have to test which survey sites have better payouts than others. That said, taking paid surveys for money won’t make your rich even if they are the highest paying online surveys. It’s just a great want to supplement your income. You may get a few surveys a week from a few sites and other only send you a few in a month. The more survey websites you join the higher your potential income will be. Usually, you’ll start by answering a few questions when you create your profile. If you do not fit their target group, some surveys will screen you out from the survey. This doesn’t mean that it’s a scam, you just didn’t qualify for the survey. For those that you are qualified, most surveys take less than 10-15 minutes and pay between $0.50 and $10. Also, look for survey sites that will still credit you even when you are disqualified to make sure you are not wasting your time. Occasionally, there are survey sites that do pay between $50 to $200 per survey if you are lucky. There you have it – the highest paying online surveys for cash that you can join right now. While you can make good extra income from these survey sites, they won’t by any means provide you with a full-time income. Stick to a few that work best for you and take advantage of any surveys they have made available as soon possible. That way you could make hundreds of dollars with your free time. Do you have your favourite surveys not included on the list? Are you looking for surveys which accept people from your country but are not included in the list? Please leave your comments below and let us know.